The swiftness with which the Islamic State in Iraq and the Levant (ISIL, now the Islamic State) assaulted and overran northern Iraq brings a new level of concern to policymakers. The offensive blew a hole in Washington’s desire to maintain “a ring of Syrian containment” that favored a political solution with limited measures to support rebels against the Assad regime. As the organization expands in number and territory, and ambitiously declaring the establishment of an Islamic Caliphate, anxiety is growing among leaders and citizens in the neighborhood. Jordan, the key U.S. ally bordering territories held by the Islamic State and comprising a central part of its desired Sunni empire, is precariously situated on the frontline of the ISIL’s violent campaign. Jordan is regularly perceived in strategic terms as a “buffer state” between Israel and its regional adversaries, between the Sunni Gulf States and the “Shi’a Crescent,” and as a receptive host to waves of refugees amid regional turmoil. But while the small kingdom is practiced in its role as regional shock absorber, the civil wars and associated state weakness in two of its immediate neighbors long dominated by strongmen (Syria and Iraq) presents a new challenge. Moreover, turmoil and tenuous status quo conditions in other proximate areas (Egypt, Lebanon, Israel and Palestine) present a geographic “ring of fire,” unsettling citizens and officials alike. President Obama warned last month that the security vacuum from ISIL’s expansion raises the prospect that destabilization will “spill over into some of our allies like Jordan.” How vulnerable is Jordan to conflict diffusion from neighboring violence? What factors create immediate security risks for the country? What options are available to mitigate the risks facing this crucial U.S. ally? There is some debate over the threat of ISIL outside of Syria and Iraq, including whetheror not it is seriously targeting neighboring Jordan. Making enemies of nearly every political and military organization not pledging bay’ah (allegiance) to the Islamic State and its leader, self-proclaimed Caliph Abu Bakr al-Baghdadi, the militant jihadist organization is preoccupied with taking and controlling territory in northern and eastern Syria and northern and western Iraq. Some analysts are predicting short-lived success for the group and its Caliphate before it buckles under its maximalist governing strategy and unwillingness to mediate disputes with other insurgent groups. They argue that the brutality and extremism that turned Sunni tribes against al Qaeda in Iraq during the Sahwa (Awakening) Movement circa 2007 will likewise distance local populations from the Islamic State today. But others urge seriousness about the Islamic State’s expansionist abilities and staying power. The surprise incursion into Iraq, starting in Mosul and proceeding systematically down the Tigris, proved the Islamic State’s objectives and capabilities were not confined to Syria. In retrospect, the Islamic State’s origins in the Iraq War and the despotic governing style of Iraqi Prime Minister Nuri al-Maliki make the Eastward move less surprising. In an attempt to consolidate its gains and defend against a multilateral response to its progress, ISIL may have limited ability to continue its march outside of Iraq and Syria. However, the organization’s transnational aims are apparent and worrying. Local sources close to jihadist circles reported recently that al-Baghdadi discussed with senior leaders “the possibility of expansion and creating a safe haven in a third country in the event of being overpowered in Syria or Iraq,” particularly Jordan, the Sinai, or the Gaza Strip. Statements from ISIL single out Jordan as a target of their attention and aspirations. Numerous videos show militants denouncing the monarchy as a “criminal and apostate” regime. In viral videos from the spring, a boy fighter in Syria is celebrated by older militants as he rips and burns his Jordanian passport and threatens Jordan with car bombs; another fighter wearing an explosive belt threatens to slaughter King Abdullah II. ISIL’s emphasis on Jordan as an impending target is not surprising. The organization was founded as an al Qaeda branch in Iraq (AQI) by the Jordanian Abu Musab al Zarqawi from Zarqa, a densely packed industrial city just northeast of Amman. Jordanian enmity toward Zarqawi and AQI grew as he tried numerous times to carry out attacks inside the kingdom. Zarqawi’s attempts to attack inside Jordan were ultimately successful, culminating in a coordinated bombing of three hotels in Amman in 2005. He was killed the following year in a joint US-Jordanian operation. After his death, Zarqawi’s al Qaeda in Iraq would come under new leadership as the Islamic State of Iraq (ISI) and then, in the context of the Syrian Civil War, the Islamic State of Iraq and the Levant. To rally supporters and attract potential recruits, ISIL publicizes its broader aims using symbolic themes that resonate across borders. Shedding references to Iraq and the Levant in its rebranding as the “Islamic State,” proclaiming Sykes-Picot null and void, and directing a Ramadan message to the global Ummah all serve to establish the organization’s transnational bona fides. Savvy self-promotion through the production of high-quality videos and the shrewd use of social media extend the organization’s reach into areas away from the battlefield. ISIL is also exploiting the ongoing conflict in Gaza to trumpet the larger goal of “liberating Palestine from the Zionists” through dual fronts in Syria and Jordan, requiring destabilization of the kingdom. The mobilizational potential of this conflict is particularly strong in Jordan, where a majority of the population is of Palestinian descent and the Israel-Jordan Peace Treaty resonates with all segments of society as an object of protest. On the supply side, then, ISIL is a compelling focal point for its ideological partisans and aggrieved, conservative-minded youth. They deliver as a source of inspiration, direction, and purpose. This is the critical concern for Jordan. The success of ISIL in battle, its enforcement of laws and norms – however primitive – over its strongholds, and the reach of its self-advertising augment its own strength while also appealing to potential adherents inside the kingdom. The size is debatable, but there is a segment of the Jordanian population that comprises this demand side. Reports last month suggested ISIL started a branch inside of Jordan. A lawyer for Islamist jihadists in Jordan “ruled out the existence of Da’ash [the Arabic acronym for ISIL] in Jordan” while acknowledging significant numbers of advocates and supporters of the organization among young people in the jihadist Salafist movement. When considering the potential for the instability to overwhelm Jordan, the Islamic State’s own capacity to wage violence is not the only, or even primary, concern. In this vein, Jordan observers tend to focus predominantly on the southern city of Ma’an. THE CASE OF MA’AN: THE FALLUJAH OF JORDAN? Recent events draw attention back to a traditional hub for contention and an occasional harbinger for more widespread upheaval – the southern town of Ma’an. Ma’an is a poor, tribal town (and province) just 150 miles south of Amman that has been the repeated scene of rioting, unrest, and clashes with Jordanian security forces. Illustratively, during past tensions, residents raised the Saudi flag in defiance of the monarchy and gave refuge to jihadist Salafist leader Abu Sayyaf after a car chase with police. In April, the security situation deteriorated rapidly as security forces sweeping the city for wanted men killed a 19 year-old under uncertain circumstances. Protests and rioting turned to clashes between residents and security forces. Demonstrators demanded the resignation of Prime Minister Abdullah Ensour and his government, and in an affront to King Abdullah, displayed a banner that read “Ma’an: We will not kneel except before God.” Within days, tribal leaders from throughout the country coordinated a gathering to mediate the situation and town notables held rallies to denounce ISIL. Ringing loudly, however, were warnings to the government not to approach Ma’an in a way that gives rise to a “new Dara’a” – referencing the southern Syrian town that erupted against heavy-handed tactics at the beginning of the Syrian revolution. Following another raid by security forces against criminal gangs at the end of June, riots and clashes again broke out in the city. 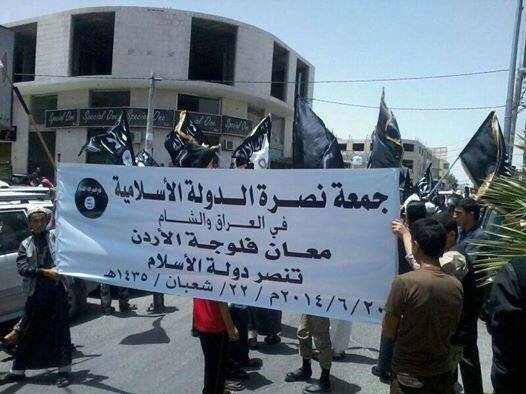 This time, and coinciding with ISIL’s gains in Iraq, larger protests voiced sectarian slogans and displayed loud shows of support for Jabhat al-Nusrah and ISIL with the black jihadist flag ubiquitous and a large banner stating “Ma’an the Fallujah of Jordan.” The reference is to the Iraqi city of Fallujah that saw revolutionary tribal militias and ISIL contingents take control of the city from the Iraqi military in January; it remains the site of continual fighting. The proximate cause of the recent flare-ups is related to security and policing. The conflicts in neighboring countries have given rise to a small-scale war economy in high poverty and unemployment areas like Ma’an that facilitate organized crime through the trafficking of weapons, drugs, and vehicles. Security forces enter the town to round up wanted criminals and, in perception if not reality, use arbitrary methods and excessive force. Instigated by these tactics and incursions, residents respond with anger. Second, the state retreated from Ma’an and other provinces in a noticeable way under the first appointed governments of King Abdullah II. State retrenchment coincided with both expanded privatization plans under these new technocratic governments and, more directly, with protests supporting the second Palestinian Intifada, demanding the closure of the Israeli embassy, prisoner releases, and “liberation of al-Aqsa.” The imposition of law and order declined drastically, creating a security vacuum and a rise in criminality. Salafi groups seized the opportunity to align street interests with their own, assert influence, and increase their capability to activate the street against the central government in Amman. Finally, the state has attempted to reassert itself haphazardly, treating Ma’an as a security problem instead of a development problem. Citizens report feeling that all Ma’anis are implicated by the government security forces in their sporadic incursions while the state shows little interest in addressing longer-term underdevelopment. Instead, the state has used public sector employment and overrepresentation in legislative positions (and the patronage this facilitates) to placate these areas.Together, each of these factors contributes to estrangement between the people of Ma’an and the state. Long-term, an environment without constructive state involvement serves as an incubator for criminality and non-state authority. Current neighboring conflicts create opportunities for illicit markets and activities that demand government intervention. Intervention is aggressive, spurning more enduring development strategies to counter subversive tendencies. Whether or not the most recent contention develops into something more, this is not the last time challenges to the state will ignite in Ma’an. Given its symbolic value as a center of state challenge and citizen grievance (as demonstrators here commemorate the 1989 protests), future unrest will have the potential to spread. Importantly, analysts must also widen their gaze. Too narrow a focus on Ma’an as the center of instability produces tunnel vision. In reality, the southern city clarifies key risk factors in the kingdom. However, varying degrees of the same conditions that have produced unrest in Ma’an exist elsewhere in the country, as do centers of jihadist Salafist coordination and activism including Salt, Zarqa, Irbid, and some of the Palestinian refugee camps. Unlike more remote rural towns like Ma’an, Tafileh, and Mafraq, these low-income urban areas are underrepresented politically and in public sector jobs. It is no surprise, then, that the impoverished neighborhoods in these bigger cities supply the majority of Jordanian jihadists in Syria. The “magnet of militancy” created by neighboring conflicts presents a multi-level challenge and requires a multi-level response. Jordan and the U.S. will need to consider policy responses to multiple contingencies that include an ISIL offensive, an internal extremist threat, and widespread unrest. A direct offensive from IS militants is possible but not imminent. The questions are whether ISIL will make the strategic move to carry out an offensive into Jordan, and whether Jordan could repel such an offensive if it occurred. In response to ISIL taking over the Iraqi side of the Karameh-Turaibil border crossing, Jordan significantly bolstered its border defenses. And with the risk of militants crossing the border to challenge the monarchy, the Jordanian Army launched a new recruitment drive to shore up its numbers and increased coordination with Saudi Arabia. ISIL depended heavily on revolutionary tribes and militias in its offensive into Iraq, but it lacks this opportunity for coordination in Jordan. Tribal unease has existed for some time, but there is no reason to worry that they will defect in favor of an extremist group like ISIL. A sizable swathe of desert separates the border area in Iraq with population centers in Jordan, giving the military ample time to intercept an advance. Jordan’s military, with support from others if necessary, will not allow the kind of staging that ISIL carried out around Mosul. Moreover, the highly professionalized Jordanian military will not lay down arms and flee as happened in many Iraqi territories. As ISIL increasingly resembles “a full-blown army,” however, Jordan knows that adequately guarding the border requires international and regional support. The U.S. should guarantee the Jordanian government unequivocal support and a “real red line” with regard to an external incursion into the kingdom. Closer to home, Jordan will need to coordinate with Iraqi tribes in the border region and Free Syrian Army units in southern Syria, both of which are familiar to the Jordanian military. Moreover, Jordan should work on its relationship with Baghdad after a conference of Iraqi opposition figures led to a flare-up in tensions. A fissure between traditional jihadists (including al Qaeda supporters) and ISIL supporters is playing out regionally. In Jordan, the dispute follows two trends defined by a fallout in prison years ago between al-Maqdisi, representing the more traditional jihadist line, and his more radical and sectarian pupil al-Zarqawi. Acting opportunistically, the Jordanian government is making use of anti-ISIL jihadist leaders who advocate jihad but, for the time at least, eschew attacks inside the country and targeting other Muslims. The Jordanian government has recently released two high-profile Salafist leaders highly critical of ISIL and its declaration of a Caliphate. Abu Muhammad al-Maqdisi, an influential jihadist leader, followed up previous anti-ISIL statements from prison with a statement deriding ISIL and invalidating the Caliphate proclamation. Prominent al Qaeda figure Abu Qatada was also released and, like other prominent Salafist leaders Abu Sayyaf and Iyad Quneibi, condemned ISIL’s actions. In response, Jordanian ISIL supporters under the name “Sons of the Call of Monotheism and Jihad” (Ibnaa’ Da’wa al-Tawheed wa al-Jihad) disseminated a repudiation of al-Maqdisi and Abu Qatada and swore allegiance to ISIL. In light of the emergent jihadist Salafist dispute, the regime in Jordan is wise to follow a divide-and-endure strategy. This internal row undermines coordination and capacity of radical groups inside the kingdom and deprives neo-Zarqawists of traditional jihadist lines of support. Moreover, the government should be careful in its application of a new and expansive anti-terrorism law. Excessive or arbitrary enforcement will antagonize Islamist opposition activists at a time when the government should utilize avenues of engagement with a wide range of Islamists, including the traditional jihadist leaders who reject militant action inside of Jordan. In a positive sign, a seven-person committee representing the movement in Jordan was created last week to “open direct communication with the government” and make demands, particularly related to pardoning select Salafist leaders. Jordan’s long-term threats to stability are no less challenging than its immediate security problem, and even add to it. Organizations like ISIL are hoping that feelings of detachment from the state among even small numbers of radicals will breed new branches and ease recruiting within the country. As in the case of Ma’an, government retrenchment is a problem years in the making and requires long-term developmental strategies to mitigate the associated risks. The more that the Jordanian government embraces the idea that security problems are governance problems, the better it will be at reducing the distance between the state and antagonistic parts of society. Even before the uprisings, civil strife, and wars-next-door, assertions of Jordan’s vulnerability to instability persisted. Experts have deemed the kingdom to be “forever on the brink.” Particularly during the wave of uprisings in the region, many observers speculated over whether the Jordanian monarchy would be “the next domino to fall.” These concerns largely emphasize the potential for domestic discontent, occasionally stoked by political crises-of-the-moment, to be manifest in an eruption of a regime-threatening popular movement. The civil war in Syria exacerbated this apprehension as hundreds of thousands of refugees presented new security challenges to the kingdom. Managing the humanitarian crisis, smuggling networks, camp riots, and other immediate refugee-related issues are onerous even prior to considering the structural impacts on the Jordanian economy and society. As the flow of refugees continues unabated, now at over 600,000 with over 80 percent living in Jordanian communities outside of the camps, communal tensions are beginning to emerge. Worsening conditions in Iraq increase the prospect of a new wave of refugees and brings further angst to the resource-strapped country. Economic disruptions have always been a trigger for strife in the country, so the government will have to enact policies that mitigate the economic impact of the “quiet emergency” felt by its own citizens, especially as unemployment is on the rise. As the primary patron to the kingdom, the U.S. can help by continuing direct grants and urging states who committed funds to Jordan’s refugee relief effort to make their payments. The current iteration of the Israeli-Palestinian crisis is also dangerous for Jordan’s domestic stability. Jordan witnessed significant upheaval coinciding with the Second Palestinian Intifada, including rioting and clashes inside its many refugee camps. Officials are rightly concerned about the Gaza incursion serving as a tool for mobilization and radicalization. King Abdullah will continue to speak out strongly against Israel’s Operation Protective Edge and show support for Mahmoud Abbas both out of sincerity and the need to appear actively engaged. As long as this round of the conflict continues, the government in Jordan will face increasingly vocal, and perhaps forceful, domestic pressure. Should domestic unrest reach a critical point – whether from bedlam in Ma’an or demonstrations against Israel or political and economic protests – King Abdullah will find it expedient to use an oft-played card in the kingdom – dismissing the prime minister and his government. Prime Minister Abdullah Ensour, like prime ministers before him, can be an internal shock absorber, temporarily mitigating domestic tensions. But this tactic requires careful use to avoid it backfiring in this especially tense situation. It will not mollify extremists, but it can appease their societal support bases, traditional opposition, and some fence-sitters. As such, it can work in the face of social unrest but not a militant insurrection. Radical and sadistic in its methods, ISIL is making rational moves according to organizational opportunities and constraints; its military exploits have been reactions to voids in state power and authority. The civil war in Syria was a prime occasion for the organization’s revival after being weakened in the 2006-2008 counterinsurgency campaign in Iraq. Sectarian and autocratic politics in Iraq delegitimized the government in predominantly Sunni areas and facilitated ISIL’s return to its erstwhile eastern base. No matter the organization’s rhetoric, a direct incursion into Jordan would defy its current territorial logic, especially as it presently focuses on consolidating gains. But ISIL has surprised before, it has ample resources, and territorial logic can give way to other offensive strategies including, for example, symbolic attacks for recruitment purposes. The U.S. recognizes Jordan’s geostrategic value and longstanding cooperation on diplomatic and security matters; as such, it should guarantee unqualified and immediate support in the event of such a hostile contingency. An inward-looking strategy is more pressing for Jordan and can yield short- and long-term security benefits. The kingdom has strong institutions, but they are also exclusionary and underlie domestic grievances. Progress on fundamental issues of representation and opportunity – long-debated but with little tangible progress – will do as much for the kingdom’s stability as military and policing. Officials and analysts know that this starts with the implementation of the 2005 National Agenda, but parochial interests and reluctance to share power continue to stand in the way. Continual failure to bring to fruition more inclusive development and reform initiatives undercuts confidence in government and strengthens subversive elements of society. Laws and practices that repress political activity and expression create hostility exactly when the government should be conciliatory to legitimate voices of dissent. Without this progress, the government will risk marginalizing itself more than the radical factions it needs to marginalize.